If a few years ago someone said that the company Kia and Hyundai cars will be produced that could compete with such representatives of the luxury segment, as Audi, BMW or Mercedes, most people would simply laugh in their face. But now both get rid of the automaker's strong reputation of cheap companies. And the latest spy shots only prove this statement. 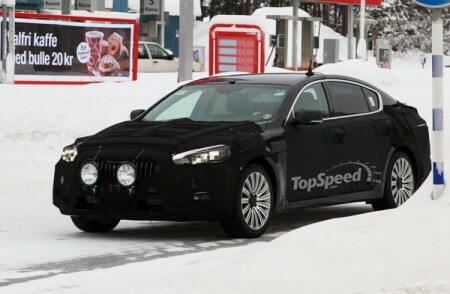 By car, which is present in this image is Kia K9, which is tested in the harsh winter conditions of northern Sweden. Better known as the "Korean Maserati Quattroporte", the model will be built on rear-wheel drive platform Hyundai Genesis sedan and borrow design elements from the recently introduced concept of GT, including its LED lights. The engine range will include three petrol and one diesel for the European market. The car will be equipped with entry-level 3.8-liter six-cylinder power about 333 hp Behind him followed by a 4.6-liter V8 385 hp Top model will be the five-liter eight-cylinder engine produces 429 horsepower. Couple all engines will be eight-speed automatic transmission.